Sun., June 26, 2011, 6:50 a.m.
To read the story, go inside the blog. Spokane city and county officials will soon be jumping into the most interesting political numbers game of 2011, the redrawing of boundaries based on the latest population figures. Although data from the U.S. Census shows that both the city council and county commissioner districts are slightly out of balance, local officials should have a much easier time than the state panel which will have to create a new congressional district in Washington. Assistant City Attorney Mike Piccolo said he expects the City Districting Board to merely “tweak” the boundaries of the three City Council districts, much the way its predecessor did after the 2000 Census data was available. Spokane’s three City Council districts were first drawn in 2000 after voters changed the city charter to require district elections. Supporters of the adopted plan said the districts represent a traditional view of Spokane, and helped ensure the northeast neighborhoods, which were often under-represented in city politics, would have to seats on the council. Herold had proposed a different plan, one that placed all of the city north of Wellesley in one district, and split the precincts to the south into the other two. That gave the districts more variety of income and politics, and made downtown less of an afterthought, he said. All three districts grew over the last decade. But the northeast’s District 1, which encompasses voting precincts east of Division and north of Interstate 90, grew the fastest and currently has about 1,750 residents above 69,639, which is one-third of the city’s population. 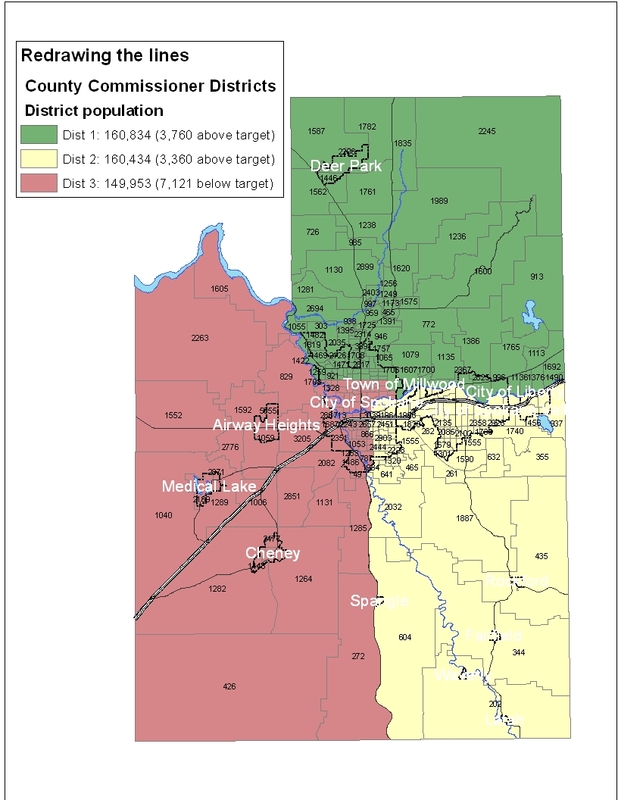 District 2, which covers most of the city south of I-90 or the Spokane River, is about 1,200 shy of that mark; District 3, generally north of the river and west of Division, is short by about 550. Despite having the most residents, District 1 consistently has the fewest registered voters, and the lowest turnout in most elections. Almost twice as many ballots were cast in District 2 in the 2009 municipal election as in District 1. The voter numbers are an interesting phenomenon, but not a reason to make major changes in the makeup of the districts, said Richard Morrill, a professor emeritus of geography at the University of Washington and an expert on population and elections. Voting patterns aren’t usually taken into account in redistricting, he said, and Spokane’s council districts may be a reasonable division of “communities of interest” – a term for population groups that share similar social or economic characteristics. That’s not a bad thing, according to Councilwomen Amber Waldref and Nancy McLaughlin, who represent districts 1 and 3, respectively. The boundaries are drawn in a way that allows them to focus on unique issues for their districts. One big question for the Districting Board will be which district will get the area of the West Plains being annexed by the city next year, Waldref said. That area covers about 10 square miles, with about 525 residents. Many of them are inmates at Geiger Corrections Center who can’t vote, but are counted in the census. Spokane is currently accepting applications for its Districting Board, which is formed every 10 years to review the boundaries. One of those applicants, former City Councilman Brad Stark, said the history of lower voting is one of the things the board should consider when deciding whether to do a major revision of the districts rather than a few shifts of the boundaries. Along with deciding how to account for the West Plains annexation, the board should consider rejoining some neighborhoods that were previously split, such as East Central and downtown, into a single council district. It will also face questions of ideological balance and incumbent protection, Stark said. Spokane County’s three commissioner districts will be updated by the commissioners themselves after some help and data from the Elections Office and the county’s Geographic information system experts. Elections Manager Mike McLaughlin said the county has received preliminary population information from the state Redistricting Commission, and is waiting for more when the commission holds a hearing in Spokane on July 14. Under state law, the commissioners must live in their district and finish in the top two vote getters of a primary there, then run county-wide in the general election. The county has one district that’s about 7,000 people below the average, and two that are between 3,000 and 3,500 above that mark. In a county with more than 471,000, that’s not a big shift. McLaughlin said commissioners could make some fairly minor adjustments, or “they could completely redo” the lines which have been in place at least since the 1980s. “The commissioners are ultimately responsible for that,” he said. Staff writer Jonathan Brunt contributed to this report.